Paul, please share your background with us before you practiced yoga. I took my first yoga class in 1996. Before I started practicing, I was drifting a bit. I had been on an academic track studying History but had opted out of doing a PhD after completing my Masters in 1993. I found academic life very isolating. After I finished my Masters degree, I then completed a filmmaking course in Vancouver and was working on independent productions in Toronto. Much of the work was decidedly unglamorous and unpaid. I made a short film with a buddy that wasn’t going anywhere and was unable to crack a serious case of writer’s block. At this time in my life, I was an angry young man. Things annoyed me in an immature, Holden-Caulfield-esque way. In retrospect, I found the paradoxes and ambiguity of the adult world upsetting. I had been smoking pot since high school and it was my means of self-numbing. I smoked a lot. It’s not like I was getting high and going to class, but it was my drug of choice during a large percentage of my free time. Within a short time after starting Ashtanga yoga, I lost interest and stopped. My road to yoga started after a bad break up in the summer of 1995. It was a relationship that had long outlived its positivity and should have ended years earlier. Let’s just say that when things finally blew up, I was suffering and was determined to begin some personal work. While I knew that I didn’t want to end up in another messed up relationship, I also recognized that I had certain patterns of response that left me feeling constrained to particular reactions. Whether these patterns were learned or environmental wasn’t that important to me, I just wanted to buckle down and retrain myself. So I started exploring. I did the Artists’ Way which was popular amongst creative types in the 1990’s. I started journaling and seeing a therapist (Canada has socialized medicine and I could see a therapist as as long as he/she was an MD). Also, on a friend’s recommendation, and to try and remove my writer’s block, I did a clown course taught by one of Richard Pochinko’s students and based on his method. It was very intense; three months long, three-four nights per week, three hours per class plus homework. This clown course was insane! It was essentially art therapy because a Pochinko Clown begins by focusing on his personal naturally occurring emotions and impulses, and then using those same emotions and impulses to create performance. It was exactly what I needed. How did Ashtanga find it’s way into your life? My first yoga classes were not Ashtanga. As an absolute beginner, I attended Kripalu classes. The yoga studio did have some Ashtanga classes but these class was described as vigorous in the pamphlet (three stars compared to the single starred Kripalu classes) and I was intimidated. I thought gentler classes would be more appropriate since I was so stiff. And I was really, really stiff. Before starting yoga, I had been an avid alpine skier who skied moguls all day long which gave me very tight hips, hamstrings and lower back. I also have very bowed legs and limbs that don’t straighten entirely. To make things even more interesting physically, I have wrists that don’t bend. Add to the above tight shoulders from playing bass guitar and you can get the picture. Asanas were a veritable festival of resistance, soreness and intense sensations for me. Anyway, these Kripalu classes were lovely and gentle and I gained some very rudimentary mind-body awareness. My body also started to open up a tiny bit. It was all very mellow. We’d relax, do some asanas, relax some more. Then, I’d drink herbal tea and eat oranges. It was pretty sweet. When I felt more confident, I attended my first Ashtanga yoga class. It was a led class and it was unlike anything I had experienced. I loved the vinyasa and loved how the movement between asanas forced my mind into a more focussed state that had the result, after class, of greater peace and clarity. I was just trying to get through class. My mind didn’t have the luxury to wander or concentrate on anything else. It was really a form of forced meditation. The feeling of clarity or peace referred to above was the by-product of NOT having thought about anything other than the teacher’s instructions for 90 minutes. That experience offered some valuable perspective on my life. What might have been dominant in my consciousness or preoccupying my thoughts vanished once I started breathing and moving in class. So, despite being crazy stiff and having a hard time physically in classes, I felt a real affinity for the Ashtanga led classes and continued attending them a few times per week. At the time, there wasn’t a Mysore program in Toronto. I started attending Mysore classes when they became available (and when I was able to wake up early enough to attend them). When I couldn’t get up for an early class, I would put on The Clash or The Beastie Boys and do my practice at home. Rachelle used to come to my apartment and find me doing my practice in my underwear (there was no such thing as yoga attire in 1996). As you began settling into the practice, did you notice any shifts in your own personal life as a result? You mentioned earlier you were irritable and angry, for example. As I said, I didn’t have much physical talent or aptitude. I also hadn’t come to yoga with any expectations in the physical realm. I had started as part of a project of self-inquiry and to get more centered. My direct experience of practice was that I would hurt myself if I pushed too hard. Particularly, once I started Mysore classes, I had to reign in any kind of ambition or envy where asanas were concerned. It was difficult and very frustrating at times, but pushing wasn’t an option for me. So I did what I could and I didn’t get sucked into the trap of equating progress with doing more asanas. Where some students would have quit Ashtanga yoga at this point, for some reason, I persevered. I might be a good example of having some karmic predisposition for practice. Who knows? While my body slowly opened up, I focussed on my breath instead of the depth of my asanas. With respect to what shifts I experienced in my personal life, through the process of struggling on my mat and only being able to do what I could, I developed humility and patience. I was forced to be accepting of my own limits and it didn’t take me long to realize that if I didn’t extend that same acceptance to others off my mat, then I would be nothing more than a self-absorbed hypocrite. Ashtanga yoga taught me to cut myself slack and then to do the same for others. It transformed my relationships with just about everybody. I became less judgemental, less angry and far less irritable. I became much more accepting. At one point, did you think, “I’m ready to visit the Source?” What was that experience like? It was during the years when Rachelle and I were living in Los Angeles (1998-2001) that I got serious about ashtanga yoga. We had moved to LA a couple of weeks after we married because I had been accepted to study film editing at the American Film Institute. Once we had settled into our apartment in West Hollywood, I noticed that there was an afternoon Mysore class nearby being taught by Jorgen Christiansson. This class only ran for a short time, but I learned a great deal. I overcame a great amount of fear and developed trust in the method. After Jorgen’s class moved back to the west side, I had to find another teacher. Because I had to be in Hollywood everyday for school, a west side yoga class was not an option. 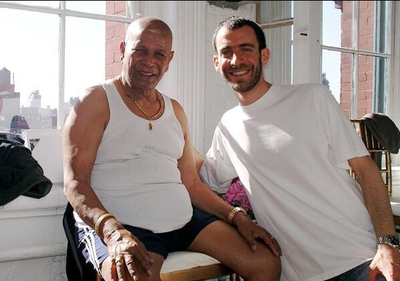 Luckily, I was able to start classes with Noah Williams who had just begun a morning Mysore program in Silver Lake. I would study with and later apprentice with Noah for the remainder of my time in LA. It was Noah and also Kimberly who encouraged Rachelle and me to go to Mysore. Going to Mysore had to wait until I graduated which occurred in Spring 2000. Our first trip to Mysore was planned for the start 2001. We arrived in Mysore on Dec 31st, 2000. We were pretty tired from three weeks of travel in North India, but we had made it and were very excited to take practice with Guruji. As fate would have it, we’d have to wait because the shala was closed for repainting. So, we settled into our noisy ground floor room at the Kaveri Hotel, found we could practice at the old post office house in Lakshmipuram and hung out until the shala reopened. What were your initial thoughts of Guruji and Sharath? 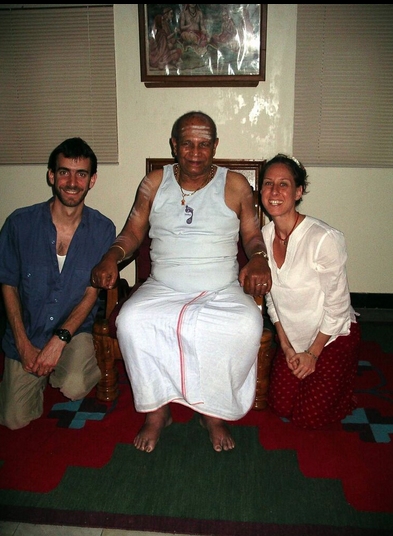 At the time, classes were held in Lakshmipuram and the shala was still called the Ashtanga Yoga Research Institute. It was great to finally meet Guruji. I had heard so much about him and it was very exciting, like meeting a rock star. I had such a deep respect for him and was grateful that I could take practice with him. Sharath was assisting and had only just started teaching a small class of his own. So, I remember Sharath would leave at some point in the morning and Guruji would teach the remainder of class by himself. Guruji was already well into his 80s and I couldn’t believe what he was doing. I thought of my own grandparents and they did not have his strength, dexterity or endurance at that age. My first trip to Mysore was a huge learning experience. I spent most of that trip hating it. I am a product of the Western educational system which is based on teacher validation in return for good work. I was a great student and received loads of positive attention and feedback from my teachers growing up. I got straight A’s; made the Dean’s List in university; I even made the list above the Dean’s List. When I started practicing yoga, I also got a lot of positive feedback from my teachers. I was a dedicated and serious student and was recognized as such. In time, I was asked to assist and then teach classes while I was living in LA. I progressed in my practice and had learned primary and intermediate series before my first trip to Mysore. I had the fantasy that I would arrive in Mysore and Guruji would recognize my dedication and have the same reaction as every other teacher I’d had since I was 10 years old. He didn’t and it drove me nuts. So, I grumbled to myself and to Rachelle for most of that trip because I felt invisible. It wasn’t until Rachelle and I returned home that I understood. On the first jet-lagged morning, when I practiced, I realized that I had been unconsciously applying my desire for approval and validation to my yoga practice. When Guruji didn’t operate within that paradigm, I hated it. How was I supposed to know that I was good? Once I was back home, I understood that my practice belonged to me and was independent of anyone’s approval or validation. I realized that while practice has the ability to open us up and give us an opportunity for evolution and awareness it can also be just another avenue for us to apply our natural tendencies and predispositions (aka our crap). It took Guruji for me to have this breakthrough. I believe he knew what I needed and could read me like a book. Having learned this lesson from Guruji, as a yoga teacher, I have always sought to empower my students so he or she would not feel dependent on my or any teacher’s good opinion or validation. While making students feel they want the teacher’s good opinion is great for business, it’s a terrible handicap to that student’s development. Unfortunately, I’ve seen it again and again… students who came from particular teachers and spent most of their time trying to impress me or apologizing because they weren’t doing the asanas “right”. It was so sad. It sounds like this is where the focus on going inward for a student, bringing the attention back to the breath and concentration is key. Which can be contradictory for western students. We see the asana portrayed as the end-and-be-all everywhere we look. How can a student best guard against this? Any thoughts? We all have our predispositions and patterns that we bring to practice. These patterns will inevitably show up. There is no avoiding it; so, we must take the pressure off ourselves to be perfect. The need for perfection turns practice into a performance rather than an exploration or conversation. We cannot guard against making mistakes. We can slowly build awareness over time. It’s a process that occurs as a result of being present-minded. Sharath encourages us to bring the yamas and niyamas onto our mats to deepen practice and our lives. This is probably the best way to guard against practice devolving into merely physical exercise or “circus” as Guruji used to call it. The asanas won’t be the end-all-be-all if we have some greater purpose or reason why we are practicing. Just a small caveat, while it’s most common to over focus on asanas, it’s possible for yoga practitioners to drive themselves crazy obsessing over perfection in just about anything, including correct vinyasa, perfect breathing, eating a perfect diet, or even perfect yamas and niyamas. What are a few key points that you know now, as a long term practitioner, compared to after 2-3 years of practice? One of the key points, having practiced for close to twenty years, is that I’ve had the opportunity to directly experience a lot of things on my mat. When I was just starting practice or, even after 2-3 years, I had to rely on the experience of others to answer many of my questions and to address my concerns. There’s a level of confidence that develops after many years. I like to call it “seasoning”. It is the result of practicing day after day, month after month, year after year. It cannot be faked, reached by any shortcut or purchased at any teacher training, intensive or immersion. Now when I experience difficulties on my mat, I can draw on past experience to help me whether it’s pain, injury (luckily, I’ve only very few in all this time), the challenge of figuring out a new asana, or managing the fatigue and boredom that can periodically arise from continuous practice over a long time. The honeymoon phase of practice doesn't last for too long. So, my past experience saves me a lot of mental and emotional energy. When I was a less experienced practitioner, I worried a lot about the sensations I was feeling. I had no idea whether the intensity was normal or ok. It was a pretty big preoccupation. I was really afraid that I was going to screw up my knees. Now, I am much more comfortable with the sensations I experience. I don't worry when I feel more intense sensations. As another example, when I was a new practitioner, there were many asanas that I was convinced I would never be able to do. Binding in marichyasana d is a perfect case in point. For me, when it finally happened, I experienced something that had once been impossible become possible and then even comfortable. It blew my mind. Since that time, whenever I have difficulty in another asana, I draw on the experience of all the asanas that I can now do that once seemed impossible. It's a long list that includes kapotasna, karandavasna, eka pada bakasana a, viranchyasana b and viparitta shalabasana. Where fatigue and boredom are concerned, there have been times on a Friday after practice that the thought of getting back on my mat Sunday morning made me want to scream. Now, in the past, I've skipped practice to sleep in or to go eat brunch. On the days that I skipped, however, I almost always regretted it because practice held the possibility of breakthroughs and self-discovery. There was an element of adventure with practice. I didn't know what would happen when I got on my mat whereas I knew exactly what sleeping in or eating brunch was all about. When I didn't practice, there would be no breakthroughs, no self-discovery and no blowing my mind. When I thought I was too tired or sore to practice, I would take a hot shower, get on my mat and tell myself to just breathe and do what I could with no pressure to perform. So many times I surprised myself by what I was able to do. Over time, with seasoning, I was able to internalize that practicing made me feel way better than not practicing which gave me the motivation to get on my mat. 1. Focus on your own practice, don't be concerned about what others are doing and measure your progress from where you’ve started not from some preconceived idea of where you feel you ought to be. 2. Stay aware of how yoga practice is affecting other areas of your life off the mat such as your sleep, temperament, digestion, and courage. There are so many ways that practice benefits us if we pay attention. 3. Find a reason to practice and to keep getting on your mat (see item 2 above) that is outside of progress in yoga asanas. This will enable you to persevere when things get tough and/or frustrating. Why do so many find this practice transitions from the physical to spiritual? The transition to a more spiritual practice is built into the method itself. The physical practice of asanas is the means of opening and strengthening our bodies and of disciplining our senses. The asanas, breathing, bandhas, drishti and vinyasa teach us how to concentrate and prepare the body as suitable vehicle for the other limbs of Ashtanga yoga. Guruji taught that asana practice sets the stage allowing us to better understand and implement the yamas and niyamas described by Patanjali. While asana is the third limb in Patanjali’s system, after yama and niyama (limbs one and two, respectively), for so many of us, it is much more useful to practice asana first. Without a strong mind, body and senses that come from an established asana practice, we can feel burdened by the yamas and niyamas as simply rules and prescriptions that either don’t have a parallel in our native culture or might only resonate on an intellectual level. We need direct experience beyond the intellect to implement lasting changes in lifestyle and behaviour. When I began practicing, I was an avid carnivore and had no particular interest in becoming a vegetarian. Had I simply been told that I should be a vegetarian, I may not have been able to make this change in my life. I may also have found the whole thing a huge turn-off and quit. However, through the practice of asana, I began to feel a greater connection between myself and other living things. This growing sense of connectedness led me to reconsider how my diet caused harm (and obvious death) to other living creatures. Each day’s practice reinforced this experience of connection which made my continued carnivorousness seem hypocritical and untenable. 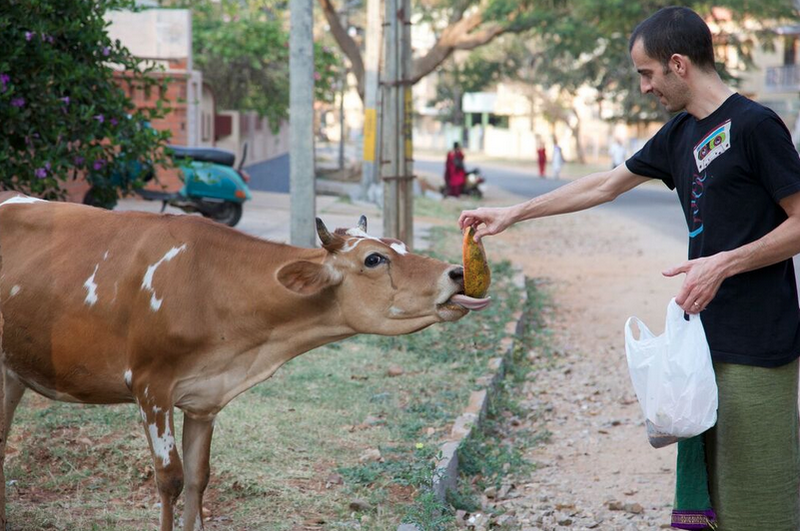 The ultimate change in my lifestyle to vegetarianism was the result of my asana practice working as a gateway to experiencing the yama, ahimsa. I could also give other examples of how I experienced other yamas and niyamas through my asana practice, but that it would cover pages and pages. Let me just say that the manner in which the practice provides a forum to engage and experience the other limbs of ashtanga yoga is very profound and goes very deep. More than anything else, it’s what gives the method the ability to transcend the physical asanas and become a spiritual place. Paul, any final thoughts on the practice? One thing that we gain through this practice is a relationship with our limitations. We cannot force our bodies. Our bodies come “as is” and no amount of pushing and prodding can change them before the time is right. We cannot rush the process of learning asanas. If we do, we risk burnout and/or injury. We just don’t have that kind of control. There is a limit to the effectiveness of determination. Regardless of how we’re feeling, we can always breathe, pay attention to what’s coming to the surface and do what we can. The rest will slowly take care of itself. It’s just a question of time and repetition.